The wife has an interesting pseudo period bedside lamp that was knocked off the side table due to strong winds in our apartment. It broke into 3 pieces. See picture below. I took our Ikea Orgel Lamp from the living room and replaced the broken pseudo lamp at the bedside table. The Orgel Lamp moved to the bedside table. The living room is now missing one light. It was a chance for me to 'contribute' and get a replacement lamp. I have always wanted to get a good reliable lamp. The wife would normally resort to Ikea but as I have blogged about it several times, Ikea lamps has reliability issues. I want to avoid Ikea and get a good designer lamp. I decided to get the Kartell Bourgie Lamp in crystal. I am quite a fan of Kartell. The company is based in Italy and its primary focus is plastic. It has extended the usage of plastic beyond the ordinary, blending technology and design into stunning furniture pieces. I am lucky to have bought 4 pieces of Kartell Louis Ghost chair for my dining table. The chair is designed by Philippe Starck. My dining table is glass table with steel fluted leg. The transparent Louis chair complements the glass table. It creates a sense of space in my dining room. Samtid Lamp at the corner. Another view of the Kartell Louis Ghost Chair. The Bourgie is designed by Ferrucio Laviani. It comprises of 2 components, the stand and the lampshade. The stand takes on a baroque style and because it is crystal, its dinstinct silhoutte can be seen from all around. The lampshade is pleated inside. This provides uplight, downlight and also, around the lampshade. With the dimmer, the intensity of the light can be controlled. The Bourgie is suitable for any type of room, residential, business or office. There are numerous fakes of Kartell products, especially the Louis chair and Bourgie lamp. But if one buys a fake, one might as well not buy at all. I bought the Bourgie lamp from Space Furniture currently located at Bencoolen Street. It is always a tremendous joy to visit Space, even when they were originally located at Millenia Walk. Now, visiting Space at its current location heightens my experience as it is like going to a museum of modern arts. The furniture items are work of art itself as one marvels at the way the designs meet its aesthetic and functional value. The Bourgie lamp costs SGD330. This is very affordable, considering that its competitor is selling the same lamp at a higher price even after discount. 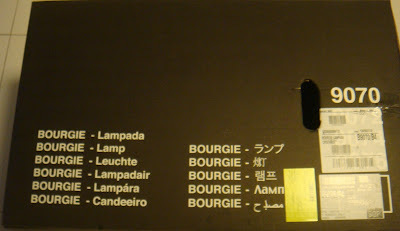 I found out that the Bourgie lamp is one of Space's bestselling item. They have around 20-30 bestselling items and they can offer these items at such a low price. The staff that attended to me was attentive, courteous and extremely patient. She had full knowledge of the various products that the store carry. Kudos to Amira Roslan of Space Furniture. Ferruccio Laviani is part of a generation of young Italian designers who came to prominence in the early 1990’s when the Memphis movement made its mark on international design. Laviani’s Orbital Lamp, manufactured by Foscarini, perhaps his best known design, uses color-saturated biomorphic shapes for glass shades, with an angular, tapering metal base. The Supernova’s clever design combines shape, shadow and light to exude an explosive movement. His Bourgie lamp combines classical design with the modern material of plastic to give a contemporary and elegant look. The box is big but can be carried. It fits nicely into the boot of a car. I think it says 'I Love K-bulb'? From left, the lampshade, the stand and the 3 bulbs. The lampshade inside the box. The light fixtures can take in 2 types of screw-on bulb. The thin and the thick. Kartell and the designer name: Ferruccio Laviani. The dimmer switch with the UK type plug. this picture shows the spacers for the height adjustment. The 3 light bulbs are provided and screwed on. How it looks like during the day. I like the contrast of dark and light. How it looks at night. Check out my blog about repairing the dimmer switch of this Kartell Bourgie Lamp here.